Our Bronze winners Richard Lorgelly (in blue) and Kyle Lewis. CPIT’s architecture students were rewarded for their creativity and innovation at the Ellerslie International Flower Show yesterday. Their courtyard gardens, constructed with support from CPIT carpentry students, won silver and bronze in the Emerging Design section. Ben Saywell, Darryl Jacobsen, Kate McDougall, Lachlan Munro, Lauren Lee and Lucy Magill were awarded silver for their garden ‘A New Perspective’ which focussed on sustainability and providing traditional medicinal native plants. Their planter boxes, which were suspended from a free standing stainless steel frame, particularly impressed the judges. Due to the cancellation of the 2011 show, CPIT competitors Daniel Webb and Kyle Lewis were unable to complete their design so they were given the opportunity to come back to Ellerslie this year. Richard Lorgelly took over Webb’s role and along with Lewis redesigned some elements to prepare the garden for the 2012 competition. 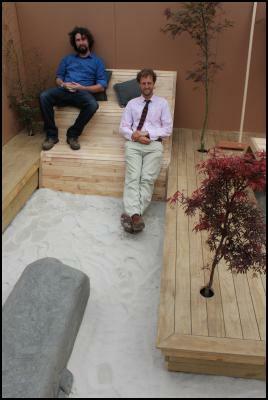 They received a bronze award with judges noting the distinct Japanese garden feel as well the innovative fluid wooden seat and table which rose from the decking. Architectural Lecturer Megan Lutton was thrilled with the outcome. “The gardens were a lot of hard work but they were a great way to practise working to a client brief and the students had fun with their projects. I am extremely proud of the awards received,” she said. The designs took students ten days to construct and prepare for judging. The collaboration with carpentry students was essential in creating some of the larger components, including a substantial amount of decking. Materials were largely funded by the CPIT Foundation and an Ellerslie Grant. The Emerging Design competition is the only competition at Ellerslie where competitors must work to fulfil a client brief. The 2012 brief sought a garden for a health conscious couple wanting to grow their own food in a small courtyard garden. The 2011 brief requested a low maintenance garden for a ‘dinky’ young couple. Real talk: Are we on track to #endmalaria?